When you’re ready to sign up for a GatherContent account, you’ll need to first open a free trial. Here's how you can do that. 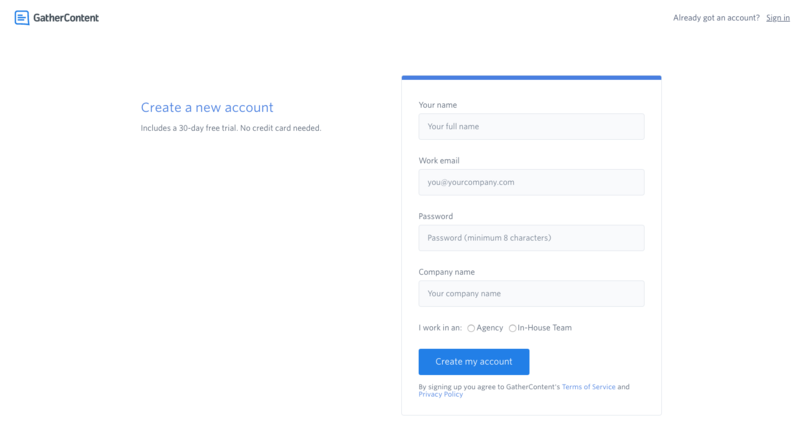 When you’re ready to sign up for a GatherContent account, you’ll need to first open a free trial. Once your trial period has come to an end, you'll then need to upgrade to a paid subscription. When you upgrade from a trial account to a subscription, all your content and the work you’ve done will remain in your account. Head to https://gathercontent.com and click on “Start my 30 day free trial”. You can also access the registration form directly. You’re now in your GatherContent account and have 30 days free! Your account has full access to all the features of a paid plan and you can add as many users to your account as you like.